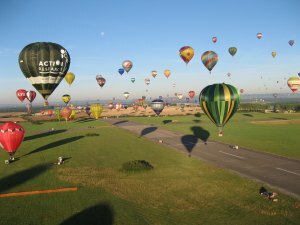 The Metz Balloon Festival, also known as the "Mondial Air Ballons" festival, is held biennially at the Chambley-Bussi�res Air Base, a former United States Air Force base in France. It is located in the Meurthe-et-Moselle d�partement of France, about ten miles west of the French city of Metz. During the Cold War, Chambley-Bussi�res was a front-line base for the United States Air Forces in Europe (USAFE). 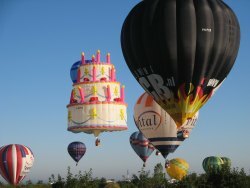 Typically 200 - 250 balloons from all over the globe partake in the event, including a huge contingent from the UK. 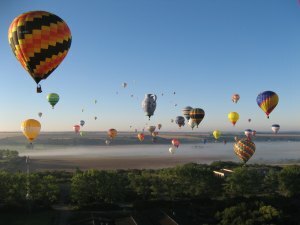 It is the second largest meet in the world, the largest being Albuquerque, New Mexico, and attracts thousands of spectators. 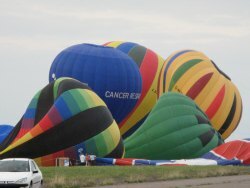 The venue is ideal with a two mile long runway alongside which the balloons are launched. This runway served as the European emergency landing site for space shuttles. 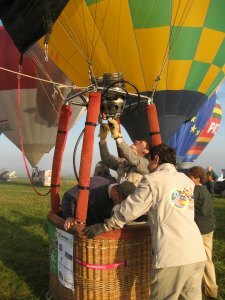 Another plus is the organisers always obtain a blanket agreement from all the farmers in the surrounding region enabling balloons to be retrieved without seeking the customary permission. 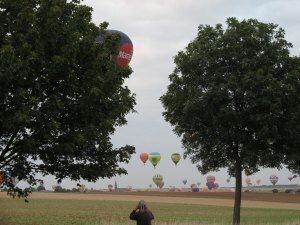 The syndicate normally attends this amazing occasion, and in 2007, took two balloons to the festival, spending most of the week there before heading off to another meet in Borken, Germany. Eight of us attended the event, enough resources to provide both crew and retrieve. One of our balloons, Crusader (with the Daily Express logo) was capable of carrying three people. The other smaller balloon, Puffin could only carry two. The corresponding retrieve vehicles and crews towed the trailers, tracking the balloons terrestrially, with the aim of providing an efficient and timely recovery. 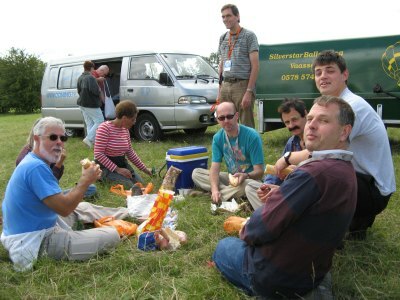 The team are shown here enjoying a first day picnic. Clockwise, from left to right, seated or on haunches: John and Frances (almost hidden) Lister, Liz and Niall Rowan, Tony and Alex Gould, and Kevin Dodman. Yours truly is taking the photograph. A splendid bunch of folk who all mucked in and enjoyed all aspects of flying and socialising; what more could you ask for. I shan't bore you with the intricacies of balloon launching, but suffice it to say that it is a meticulous process, with numerous safety checks along the way. The adjacent photos show Niall and Alex making the final pre-flight checks before launch, with Tony keeping a watchful eye. 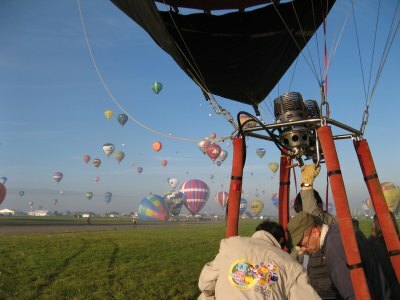 Launches usually occur during "still air" conditions, that is at dawn or evening, in order to avoid the nasty thermals that occur during the middle of the day. Here we have an early morning launch, with the mist slowly burning off with the rising sun. 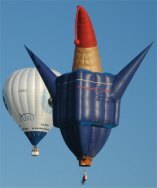 These photos give a flavour of a balloon launch, and the variety of balloon shapes. Some balloons don't even have a basket suspended under them; the picture on the right showing a chap dangling in a bosun's chair below his balloon. During the afternoons, we took the opportunity to explore the local area. We were based on the northern end of Lac de Madine, and to the south of this beautiful lake lay Montsec, an isolated hill (Thiaucourt) where the World War I Montsec American Monument is located. One afternoon, Kevin, Alex and I visited the monument. The joy of the delightful surroundings was counterbalanced by thoughts dwelling on standing a hill where so many soldiers lost their lives; a moving experience. 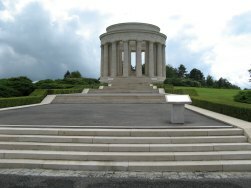 On another afternoon, the whole team visited Verdun, site of a major battle of the First World War. Here, one of the costliest battles of the war took place, exemplifying the policy of a "war of attrition" pursued by both sides, leading to an enormous loss of life. Here we see the Verdun Monument in the background. ........ and drifting off over the newly harvested corn fields. Equally exhilarating is an evening flight. 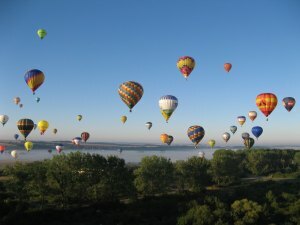 Here is a good shot of balloons hugging the contours of the land as they disappear over into the next valley. 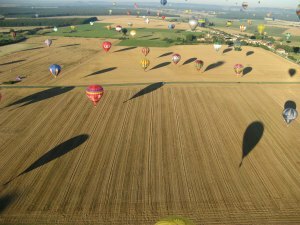 Balloonists don't tend to get much of a kick from high altitude flying, and often relish the challenge of just skimming the top of the corn and hopping over the hedges. Having said that, on one of the days some intrepid balloonists set off before dawn with the sole intention of a long flight. They got as far as Zurich; one hell of a retrieve! 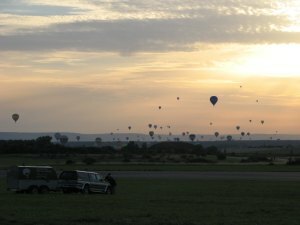 When I was doing a retrieve on one of the flights, I passed a Belgian balloon crew who had landed in the same field as our balloon, had already packed their balloon away and were waiting for their retrieve vehicle to turn up. I exchanged pleasantries and drove on to help recover our own balloon. When driving back across the field, the Belgian team was still waiting, so we stopped and shared a few beers with them, as you tend to do around 8am after an early morning flight. Eventually their retrieve van turned up, and the driver hopped out and helped them pack their balloon into the back of the van. By the time the balloon crew had got into the front of the van there was no room for the driver. No problem, he calmly pulled out a paraglider, laid it on the stubble, attached a fan to his back, and then himself to the paraglider. He simply set the fan motor to idle, tugged the wing into the air, trotted a few steps, turned the fan speed up and took off. That's one way of getting back to the airfield!